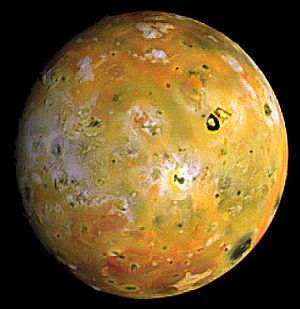 The moon Io is the innermost of Jupiter's four main satellites, those known as the Galilean moons. It orbits at 262,032 miles out from its planet every 1.77 days. With a diameter of about 2275 miles, it is the fourth largest moon in the solar system. Because of the gravitational tug-of-war it experiences between Jupiter and the three other Galilean moons, Io is the most geologically active object in the whole solar system. The mechanism results in the heating up of the moon due to the friction generated and this causes volcanic activity. In fact, Io has over 400 active volcanoes. Some of these are huge and, when erupting, can shoot plumes of sulphur and sulphur dioxide as far as 300 miles above the surface. All this volcanism continuously reshapes Io's surface features. Its colourful appearance in the top image is as a result of different compounds of sulphur being spontaneously formed. The moon also features huge lava flows of up to 300 miles in length. 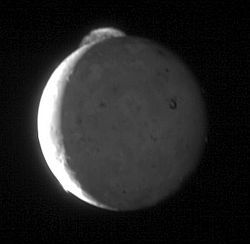 Because of this, the moon Io doesn't display any impact craters. Whereas other moons in the outer solar system are primarily formed from ice and silicate compounds, Io's composition is iron and silicate rock. It is probably because of this that it is the densest moon in the solar system. The interior of Io has the usual three divisions - crust, mantle and core. 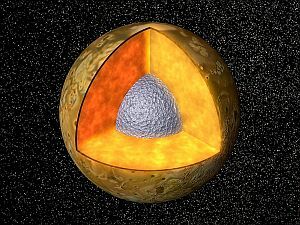 The outer two sections seem to consist of silicates, while the core, comprising some 20% of the mass of the moon, is either made of iron or an iron/sulphur mixture. A noteworthy feature of the mantle is the existence of a magma ocean, around 30 miles below the surface. This ocean, which is 30 miles thick, has temperatures that can reach 1,200 degrees Celsius. As said earlier, the surface of Io is constantly being reshaped, due to its many active volcanoes. The moon does possess other features too, however. It has up to 150 mountains, averaging four miles high, although some can be as much as 10 miles. Most of them are formed from tectonic activity, rather than volcanic and are either plateaux or tilted blocks, with a shallow slope one side and a steep slope the other. Yes, Io has an atmosphere, albeit a very thin one. It consists mainly of sulphur dioxide, with traces of sulphur monoxide, sodium chloride, oxygen and sulphur atoms. This layer of gas is constantly being blown off into space by the powerful magnetosphere of Jupiter, at a rate of one ton every second. 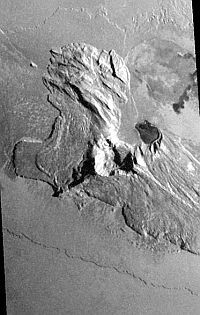 Thus, it needs regular replenishing, which comes from volcanic activity ejecting the gas into the atmosphere, plus the faint heat from the sun causing any gas trapped in surface ice to be released, too.